Sauerkraut is a simple concoction of cabbage and salt that is allowed to ferment until it takes on a softly wilted texture and rich, briny taste. 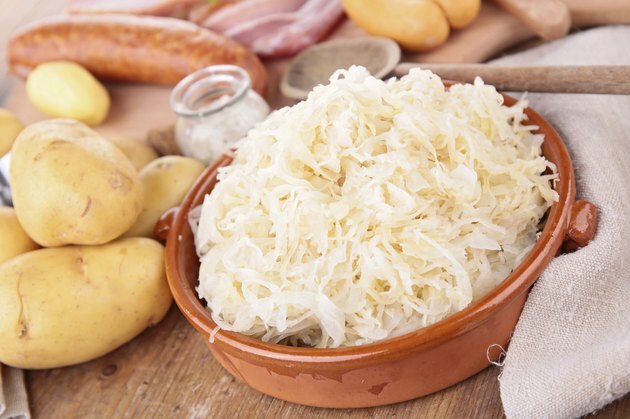 Sauerkraut contains iron and vitamin C, and one cup offers only 44 calories. Preparing packaged sauerkraut saves you the four to six week fermenting time required for making it at home. Cooking packaged sauerkraut can be as simple as popping it into the microwave, but the longer you cook packaged sauerkraut, the milder it becomes. Set a mesh strainer into the sink. Pour the packaged sauerkraut into the strainer and let it drain thoroughly. Run cool water over the sauerkraut, tossing and mixing it to wash off most of the brine. If you prefer the sharp, salty taste of the brine, skip this step. Place the sauerkraut into a pot and barely cover it with water. Add a splash of white wine, if you like. This adds flavor and helps increase the sauerkraut's tenderness. Bring the liquid in the pot to a boil. Set the lid onto the pot and turn the burner down to its lowest setting. Let the sauerkraut simmer for 30 to 45 minutes. Drain the sauerkraut by placing it in a mesh strainer in the sink and pressing down on the vegetable with the back of a spoon. Rinse it well for a milder flavor, and press it again. Place the sauerkraut into a microwave-safe bowl and add enough beer or water, or a half-and-half mixture of both, to just barely cover the sauerkraut. Microwave the sauerkraut on high until it is tender; times will vary depending on the amount of sauerkraut being prepared. If necessary, stir it once at the 10-minute mark. Add caraway seeds and fresh cracked pepper to your sauerkraut for a little extra flavor.